This IBM Redbooks® publication, Volume 5, describes how the Watson Language Translator service can be used to translate text from one language to another. It introduces the concepts that you need in order to understand how to use the Watson Language Translator service. It provides an example of an application that integrates the Watson Language Translator service. You can develop and deploy the sample application by following along in a step-by-step approach and using provided code snippets. Alternatively, you can download an existing Git project to more quickly deploy the application. 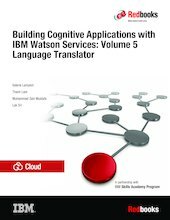 This book also covers a mechanism provided by the Watson Language Translator service to train the service to perform domain-specific translations by customizing the existing linguistic models.